Discover how a young man's entrepreneurship combined with holographic content created great sales and branding results for this Danish confectionary brand. In 2007 an adventure began when Johan Bülow decided that liquorice could be much more than just a salty and strong tasting confectionary for Danes. The 23-year-old began experimenting with liquorice in his mother’s kitchen back home on the island of Bornholm, planning to produce a generous amount of gorgeous liquorice for the approaching summer season and bringing it to the palates of both Danish and foreign tourists. Today LAKRIDS by Johan Bülow is recognised as a supplier of high quality confectionary, and the brand covers everything from small treats of pure liquorice and chocolate covered liquorice bites with various tempting flavours to syrups and powdered liquorice for cooking purposes, and even a cookbook to help you with the ideas and practices of preparing food and baked goods with liquorice. Bülow has certainly made it big, and where do you turn - what do you do, when you want to go the extra mile and market your product extraordinarily when you’re top of the line and setting the standards in your field? Johan Bülow turned to Realfiction, and together they made a plan to equip a high-end department store in central Copenhagen with a Dreamoc, some liquorice, and a whole lot of wow. Two tins of the most popular liquorice products were placed inside the display, laid on the side with their treats spilling out onto the bottom of the display. A third tin with a black label was placed on a tiny pedestal in the centre of the Dreamoc. Normally the label has a number on it and some text informing the consumer what kind of flavours are in the particular product. Leaving the label blank gave the designers the opportunity to make a holographic film with the various ingredients and numbers to show an audience the versatile flavour profiles of the various products and have this three-dimensional information flowing around the products on display. The point was to not only tell the audience about liquorice and why they should buy it, but to give the customers something more. In this case showing everyone what to expect when sinking their teeth into a morsel of liquorice with chili flavoured chocolate by having holographic flames engulf the small liquorice tin promising that this will be a hot experience. Or by having ripe berries encircling the tin telling onlookers that a taste of this liquorice is a boost of berry flavour while the label changes and adjusts to the flavours in the holographic content. 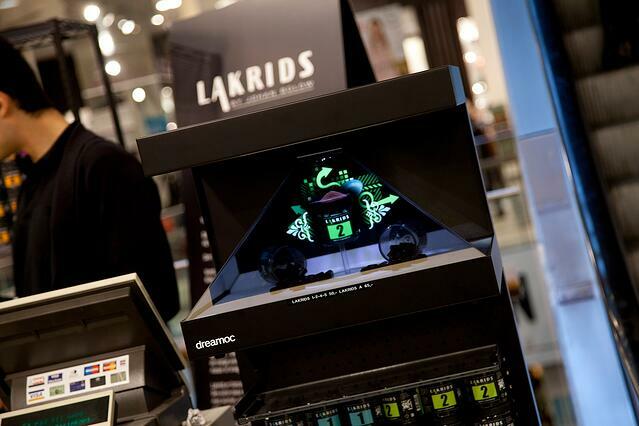 For a month the Dreamoc display was set up various places in the department store as both an end cap solution as well as on the checkout line, and both were very effective for grabbing the attention of passers-by, making them stop and look curiously into the display - and most often actually purchasing the product. In the first week sales increased by 110 % and during the month of advertising the total increase of sales was 180 %. Get the full case study for the full experience right here.